Anthracite Filter Media derives from the crushing of natural Anthracite. 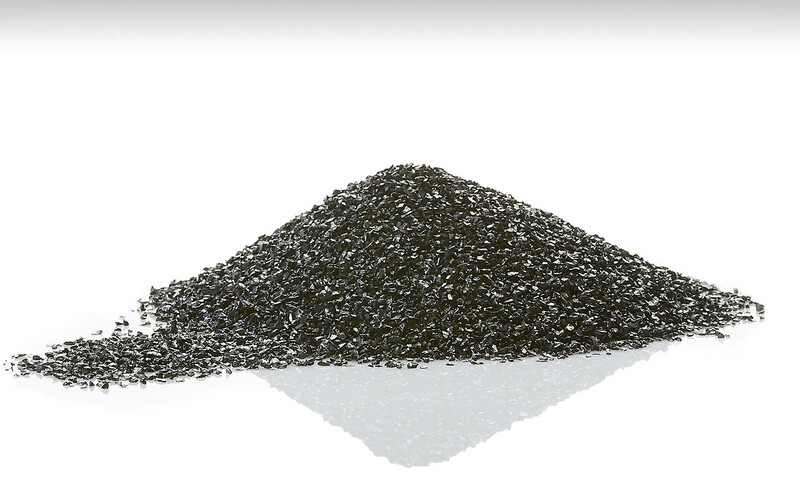 The granules produced have a dark shiny appearance, an angular shape and are classified in specific granular grades in line with the EN 12909 Standard for filling materials in filters of water intended for human consumption (potable). The required filter bed of Hydro Anthracite depends on the specifications of each facility and the use of the produced water. Typically it is used as an upper layer of a height at least 300 mm higher than quartz sand in multi-media filters, or as a single layer of a height of at least 500 mm, when it is the only filtering medium. STROUMBOULIS, in its continuous efforts to offer high quality products to the market, collaborates with the leader in the production of Hydro Anthracite filters in Europe, the German manufacturer brand EVERS GmbH&Co.KG. This Manufacturer specialises in the treatment of Hydro Anthracite (crushing, washing, drying, classification) since the 1980s. The Hydro Anthracite EVERZIT N is extracted in Northern Germany from a depth of 1500m. The specific deposit is of high quality and of a particular structure. Furthermore, the Manufacturer, through complying with the quality management standard DIN EN ISO 9001: 2000 and the environmental management standard DIN EN ISO 14000, guarantees consistently high quality at all stages: production, trade, storage, sales and development activities. The granules size classification follows a special and highly accurate procedure for complying with specific application requirements (particles of oversize and undersize <5%). Full compliance with DIN, EN, AWWA and all relevant international standards is achieved, and in many cases – due to the internal quality control system – much stricter specifications are achieved than those required by the standards. Thanks to the specialised expertise and the high level of technological know-how in the water treatment sector, the Hydro Anthracite EVERZIT N is used across a wide range of facilities worldwide. STROUMBOULIS offers the Hydro Anthracite EVERZIT N with all its certifications as well as with the flexibility – high quality service in terms of the availability – deliveries to its Clients. As a natural mineral, Anthracite must be suitably processed before it can be used in filters for water (Hydro Anthracite) intended for human consumption. Hydro Anthracite intended for use in water filters must have certification of compliance with the EN 12909 Standard.